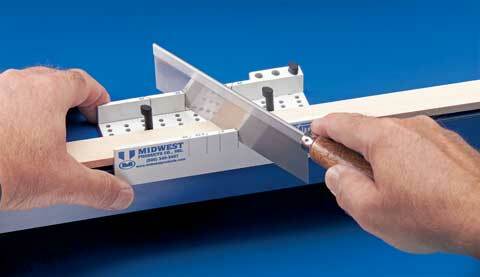 This miter box allows you to cut five miter angles - 30º, 45º, 60º, 67.5º, and 90º. It accepts materials as wide as 2” and as thick as 1/2”. It is injection molded and also features three unique cam clamps that hold the material being cut firmly in place. Includes a razor saw.